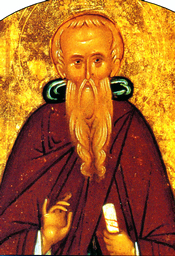 Saint John, whose national origin remains unknown, was called Climacus because of a treatise he wrote called The Ladder (Climax) of Paradise. He made such progress in learning as a disciple of Saint Gregory Nazianzen that while still young, he was called the Scholastic. At the age of sixteen he turned from the brilliant future which lay before him, and retired to Mount Sinai, where he was placed under the direction of a holy monk named Martyrius. Once that religious journeyed to Antioch and took the young John with him; they visited Saint Anastasius, a future Patriarch of Antioch, and the Saint asked Martyrius who it was who had given the habit to this novice? Hearing that it was Martyrius himself, he replied, And who would have said that you gave the habit to an Abbot of Mount Sinai? Another religious, a solitary, made the same prediction on a similar visit, and washed the feet of the one who would some day be Abbot of Mount Sinai. Never was there a novice more fervent, more unrelenting in his efforts for self-mastery. On the death of his director, when John was about thirty-five years old, he withdrew into a deeper solitude, where he studied the lives and writings of the Saints and was raised to an unusual height of contemplation. There he remained for forty years, making, however, a visit to the solitaries of Egypt for his instruction and inspiration. The fame of his holiness and practical wisdom drew crowds around him for advice and consolation. In the year 600, when he had reached the age of seventy-five, he was chosen as Abbot of Mount Sinai by a unanimous vote of the Sinai religious, who said they had placed the light upon its lampstand. On the day of his installation, six hundred pilgrims came to Saint Catherine's Monastery, and he performed all the offices of an excellent hotel-master; but at the hour of dinner, he could not be found to share the meal with them. For four years, said his biographer, a monk of the monastery of Raithe, he dwelt on the mountain of God, and drew from the splendid treasure of his heart priceless riches of doctrine which he poured forth with wondrous abundance and benediction. He was induced by a brother abbot to write the rules by which he had guided his life; and the book which he had already begun, The Ladder, detailing thirty degrees of advancement in the pursuit of perfection, has been prized in all ages for its wisdom, clearness, and unction. Reflection. Cast not from thee, my brother, says the Imitation of Christ, the assured hope of attaining to the spiritual life; thou hast still the time and the means.